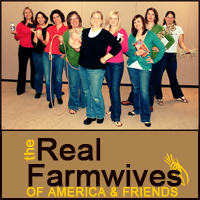 I have infiltrated a group of real blogging farm wives known as The Real Farmwives of America & Friends, led by Heather of 3 kids and lots of pigs (we have things in common, wouldn't you think). 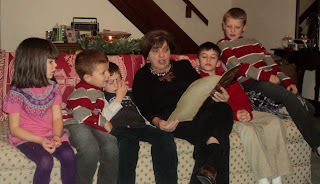 They graciously allowed me to join their quarterly blogging feature, this time with the theme of holidays on the farm. Of course, I have already screwed it up. I woke up this morning to find their beautifully crafted posts already online and cross-promoted on their Facebook page. Here it is at 10 p.m. on New Years Eve and I'm still typing--I have until the ball drops, right? At first I thought, our holidays are pretty normal, there's nothing significant. 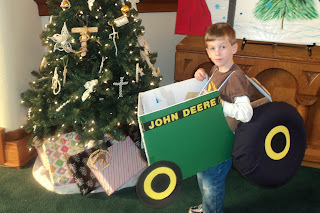 Then I wondered how many Presbyterian Church Christmas plays across the country included a role for a John Deere tractor. Maybe we are a little different here on the farm. Also, just for kicks I have to share that our church is on Chicken Bristle Road--that is a real place. And some of our holiday traditions, while not uniquely rural, are quite quaint. My mother-in-law not only sees all five of her grandchildren every Christmas Eve, she gets to read Twas the Night Before Christmas using her valuable antique edition of the book. Gift-giving is a little different on the farm too. 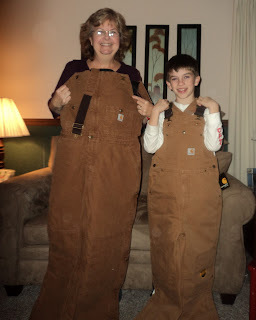 Here my Mom and Ryan show off their grandma/grandson matching Carhartt bibs. She got hers to stay warm while she operated the John Deere snow blower. Again, how many grandmothers received outer wear designed for snow blower operation this Christmas? I think that's what I like best about Christmas on the farm--the sincerity of the gift-giving. We don't just give each other the same bottles of wine and gift cards (not that those gifts aren't welcome) but we also give practical gifts, gifts from the heart. Gifts like the wheelbarrow Husband got from my grandparents a few years ago--he said he didn't want anything, I needed a wheelbarrow, it all worked out. And this year, my brother-in-law got a crowbar! One year, Husband delivered a pig to a neighboring family. The wife wanted to surprise her husband with a new gilt. Holidays on the farm are always warm and fun--tempered sometimes by the 365-day demands of farm work. I'm glad to be raising kids who are just as excited about receiving a new pig cane and brush from Uncle John as the DS games they get from Santa.